Each year brings a new wave of technological advancements and trends in the tile industry, and 2018 was certainly no exception. 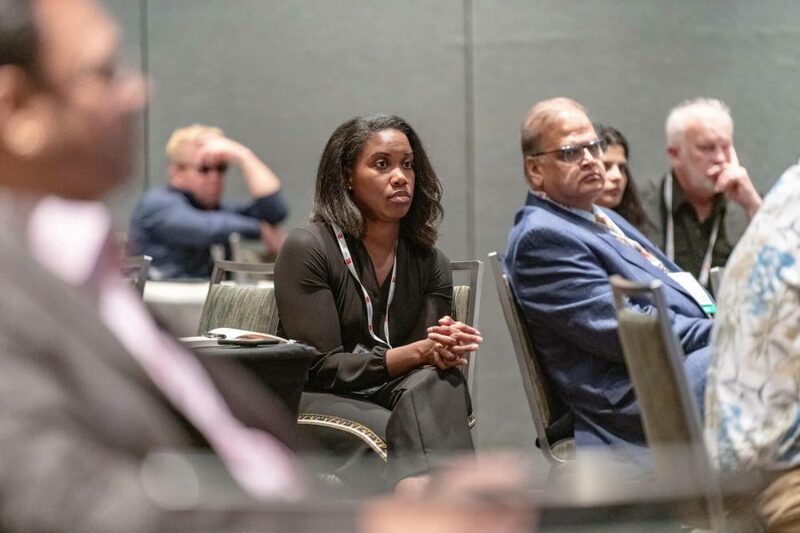 From digitally-manipulated marble patterns to nontraditional applications with ultra-thin, large-format slabs, Italian ceramic and porcelain tile manufacturers have demonstrated a commitment to pushing the boundaries year in, year out. 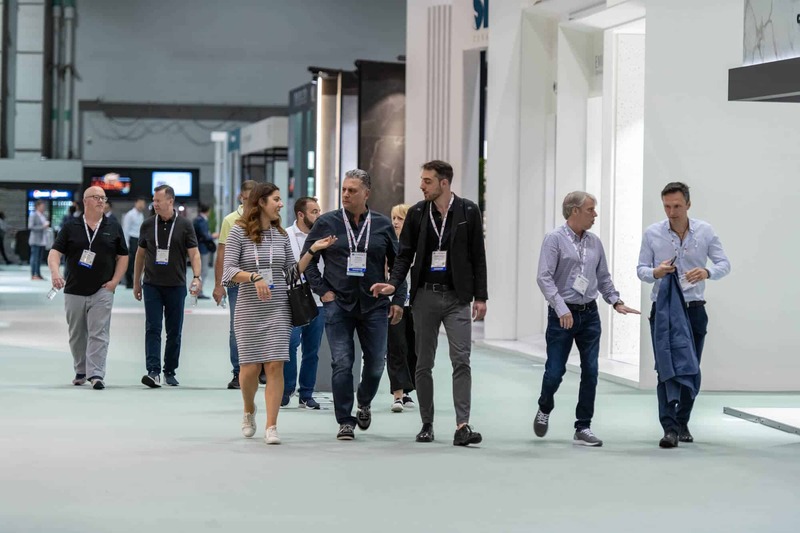 Here are seven of the biggest tile trends as seen in the hundreds of new collections from Ceramics of Italy member manufacturers at the 36th edition of Cersaie. 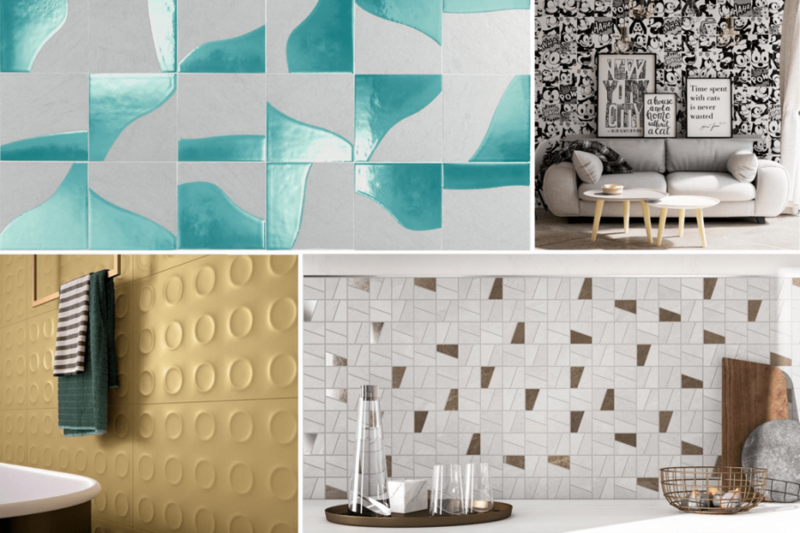 To see these trend-setting tiles in person, visit the Ceramics of Italy Pavilion at Coverings 2019! This year, it wasn’t just the patterns and sizes that impressed with their seemingly endless variety and sense of inventiveness. Tile producers have completely upped the ante in terms of surface design, which can be seen in dozens of awe-inspiring, new finishes and textures designed for aesthetics as well as functionality. Two collections that artfully demonstrate this trend, as well as ceramic tiles’ chameleon capabilities, include Ceramica Sant’Agostino Lakewood that conjures oiled wood planks with a hand-planed surface and Vallelunga Cavawhose marble design and satin finish looks like an ancient European church floor. 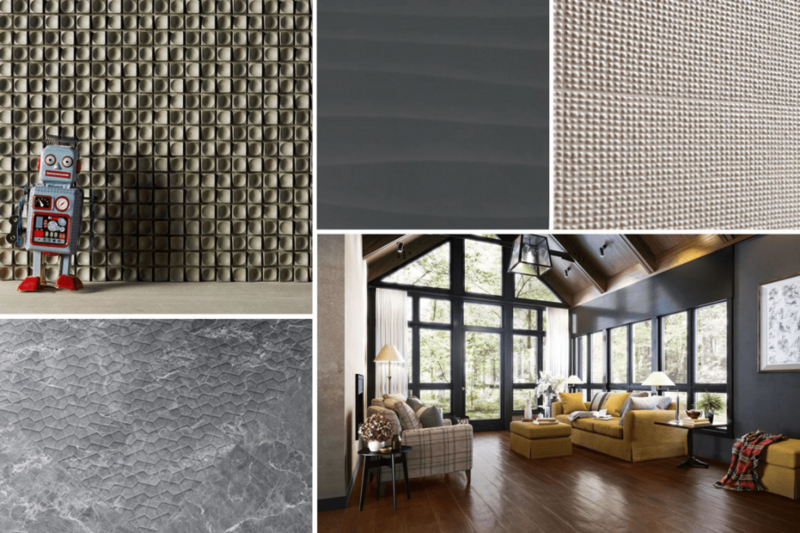 Additional collections include: 14oraitaliana Slice, Campani Divinae, Bardelli Pittorica, Coem Moonstone, Decoratori Bassanesi Tartan, Cerdisa Espirit, Cir Paris, Ergon Woodtouch, Fap Lumina, Imola Blue Savoy, Italgraniti Icône Bleu, Made +39 Cube, Marazzi Eclettica, Marca Corona Arkistone, Piemme Shades, Supergres Met-All, and Viva Yaki. 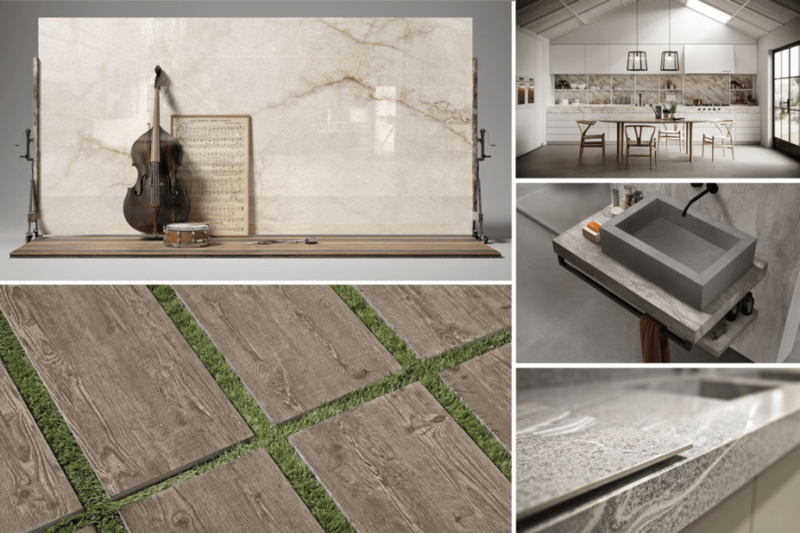 For years, Italian tile manufacturers have been expanding the definition of a product, offering specifiers a whole suite of surfacing tools around a single idea or design. At first, it was a range of colors, finishes, and sizes as well as complementing decors and trims. Now, with continued investment in production equipment, many companies are expanding their range of thicknesses – and thus applications – with tiles ranging from 3-30mm including a new 12mm thick porcelain tile specifically designed for kitchen countertops, bathroom vanities, tables, and outdoor kitchens. Examples include Ariana Bath Design, Atlas Concorde Atlas Plan, Blustyle Yosemite, Emilgroup Level, FLORIM stone, Gigacer Pietre, Keope Plus, La Fabbrica, Ca’ Foscari, Lea Bio Select, Mirage Esprit 2.0, Panaria Context, Serenissima Magistra, Sicis Vetrite, and Supergres Stoorm. From three-dimensional tiles that look like giant Lego bricks (Marca Corona Bold) to popular cartoons illustrated on ceramic (Del Conca Felix the Cat), when projects call for playfulness, Italian tile answers in full. 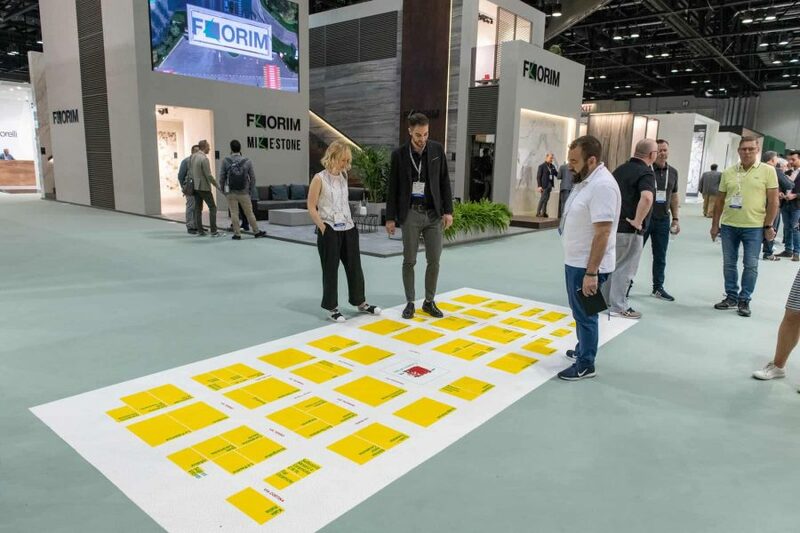 Companies are continuously experimenting with color, size, and patterns to create one-of-a-kind surfacing for architects and designers. They also offer tailor-made solutions like Ornamenta’s ability to print large porcelain slabs in any Pantone color. Additional examples of this trend include: ABK Wide&Style Dark Edition, Appiani Denim, Atlas Concorde Boost, Caesar Core, Ceramica Francesco di Maio Puntini, Del Conca Sorrentina, Fioranese Liquida, Fuoriformato Tropik, Gardenia Orchidea Make, Gigacer Avantime, Leonardo Ashima, Marazzi D_Segni, Rondine Swing, Mosaico+ Diamond, Naxos Lumiere, Tonalite Joyful, and Unica Remix. Moving beyond common varieties of stone like Carrara, statuario, and travertine, Italian tile producers are scouting quarries throughout the world to find obscure marble full of color and character or digitally manipulating the look of natural stone to create something that is literally out-of-this-world. For Sicis’ ever-evolving Vetrite collection, the enchanting magic of 13 gemstones is captured and amplified in between giant sheets of glass to create lunar-like landscapes for the Gem Glass line. Meanwhile, Refin Stardustcombines the nebulous veining of alabaster with elegant metallic surface effects to create a line of porcelain tiles inspired by the nighttime sky. 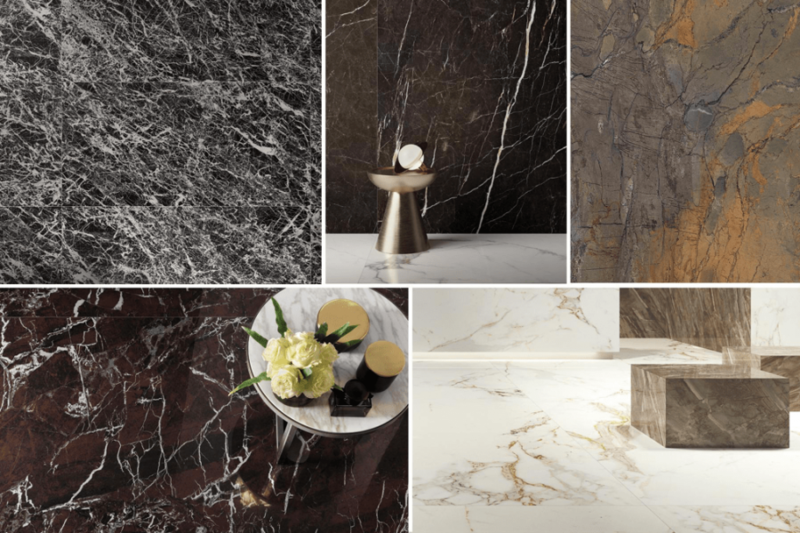 Other collections include: Atlas Concorde Marvel Edge, Ava Preziosi, Casalgrande Padana Onici, Ceramiche Piemme Majestic Valentino, Cercom To Be, Cotto d’Este Vanity, Edilgres I’m Italian Marble, Emilceramica Tele di Marmo, Fire Transalp, Fondovalle Shards, Imola The Room, Italgraniti Mega, LaFaenza Bianca, Lea Delight, Marazzi Grande, Novabell Imperial Michelangelo, Panaria Eternity Zero.3, Rex Etoile di Rex, Stile Italia Extra, and Supergres Purity of Marble. 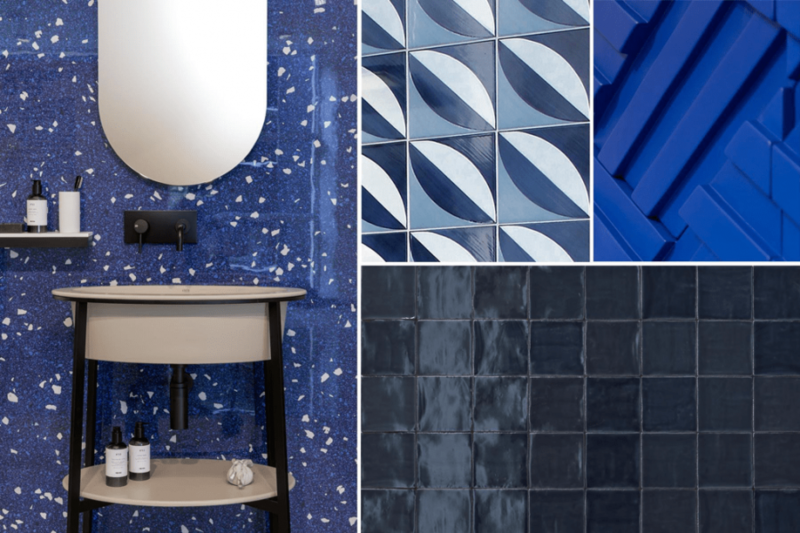 Whether soft or electric, blue is one of the hottest hues in tile design this year, offering a revitalizing pop of color to a variety of interiors. Some, like Cedit’s Rilievi sculptural ceramic wallcoverings, is the kind of hyper blue associated with contemporary artists Yves Klein and Frida Kahlo. Others, like Refin Creos and Provenza Vulcanika, conjure the feeling of vacation and the shallow teal waters of the Mediterranean Sea. Additional collections include Appiani Denim, Casa Dolce Casa Artwork, Ceramica Colli Fes, Ceramica Francesco di Maio Blu Ponti, Ceramica Sant’Agostino Vita,Ce.Vi. Ceramica Vietrese Happy Days, Cerasarda OT07026, Cir Miami, Fap Pat, Level Raku, Made+39 Acquerello, Tonalite Provenzale and Vogue Dekorami. Italians are known for their rich artistic heritage, which is now rendered on big porcelain slabs with minimal grout lines to create the alluring effect of wallpaper with the technical benefits of ceramic. 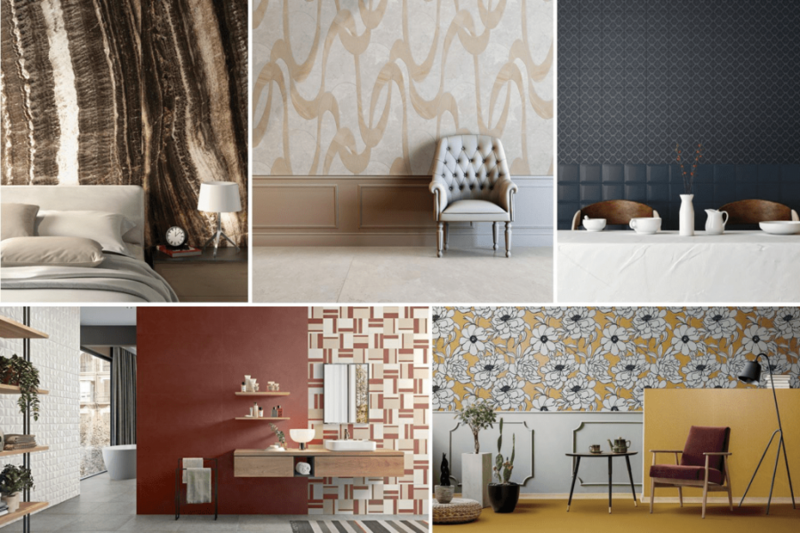 In fact, some companies are even marketing their products as ceramic wallpaper, offering an expansive catalog of patterns digitally printed on tiles up to 5.25’x10′. One example is ABK who introduced Dark Edition as a capsule collection inspired by the Gothic side of nature for its ever-expanding Wide&Style line. Another company is Fuoriformato who offers an explosion of color and pattern on large ceramic surfaces that can also be used as furnishing elements. Additional examples include 14oraitaliana Tahiti, Casalgrande Padana Onici, Fioranese Liquida, Keope Eclectic, Mirage Bottega, Ornamenta Operae, Panaria Even, Rondine Swing, Stile Italia Extra, Unica Garden, and Vallelunga Sospiri. 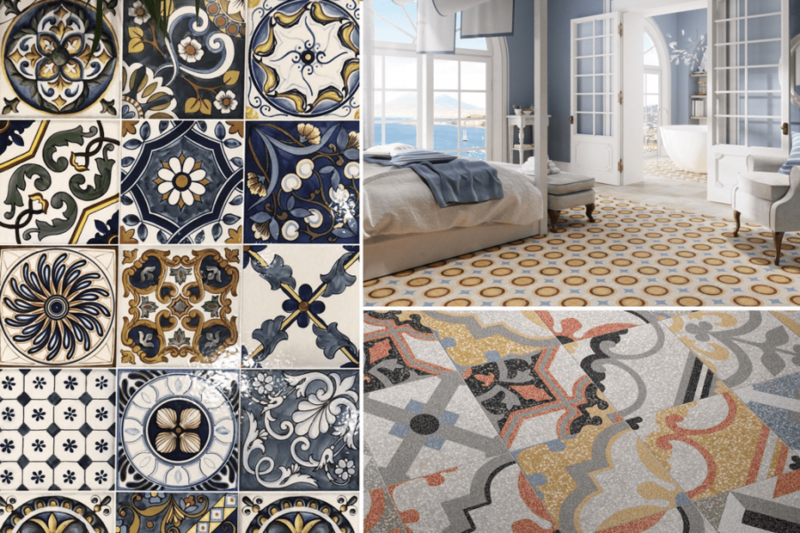 From ancient forms and 18th-century patterns to tiles inspired by charming places seemingly stuck in time, Italian tile manufacturers are finding creative ways to make the old feel new again. Mixed and matched patterns, like those of 14oraitaliana’s Folk and Ceramica Sant’Agostino’s Vita collections, evoke the imagery and vibrant colors of Italy’s most famous and beloved territories. Fioranese’s Liquida slabs resemble 1950’s-style wallpaper, while the earthy tones and textured surfaces of Provenza’s Terraquea collection recall traditional terracotta ware. Designed with nostalgic sentiments, each of these collections combines the aesthetic and cultural qualities of the past with the technological innovations of today. Other collections include ABK Dark Edition, Ceramica Colli Fes, Ceramica Vietri Antico Mediterranea, Cerasarda OT07026, Cir Miami, Faetano Sorrentina, LaFabbrica Space, Marca Corona Ossidi, Rondine Swing, Serenissima Magistra, Tonalite Aquarel, and Unica Pece.